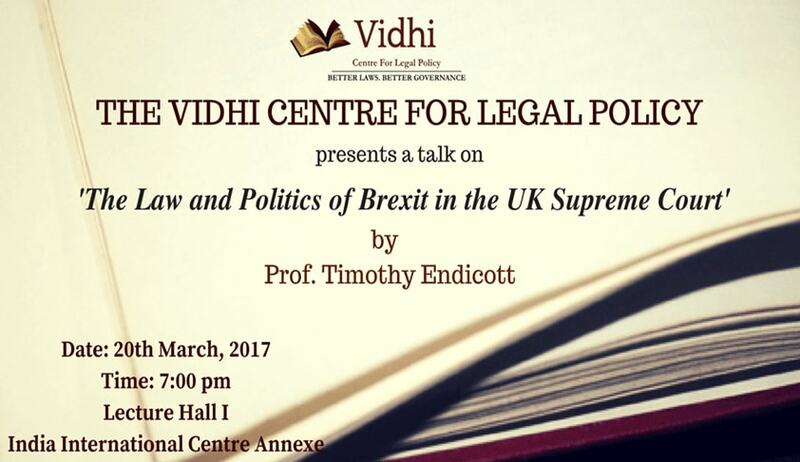 The Vidhi Centre for Legal Policy cordially invites in their latest talk on the Brexit case (R. v. Secretary of State which revolves around the process for initiating Britain’s exit from the EU—primarily, whether Article 50 of the Lisbon Treaty (under which a member country’s exit is to be negotiated) can be triggered by the executive without parliamentary approval. Theresa May’s government had advocated the use of an executive power termed the ‘royal prerogative,’ which arguably empowered it to commence exit negotiations without the consent of Parliament. This argument was rejected by the UK Supreme Court in January 2017, thereby requiring the government to go back to Parliament and seek its approval before triggering Article 50. At the talk, Professor Timothy Endicott (former Dean of the Faculty of Law at University of Oxford) will describe the political climate and legal position which led to the UK Supreme Court's decision. Prof. Endicott had delivered an earlier talk at Vidhi on 'Arbitrariness' in March 2014.